Cambridge Audio Sonata DR30/CD30 review | What Hi-Fi? In this world of iPods, wireless gadgets and streamed media, traditional hi-fi manufacturers have tried a variety of ways to offer the consumer a blend of style and substance. Cambridge Audio's new Sonata range represents one such attempt – to create 'miniature' audio components, which offer the compact dimensions of a micro while retaining the sonic sophistication of hi-fi separates. 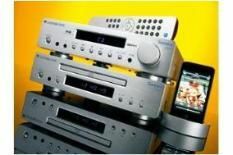 The two-box combination on test includes the £350 CD30 CD player, plus the £200 DR30 stereo receiver. This 2.1 receiver is the hub of the Sonata range – which also includes the 1080p-upscaling DV30 DVD player – and delivers 40W per channel, has both DAB and FM tuners and usefully comes with a bespoke iPod dock. To be clear about what CA means by 'mini' separates: both these units measure 27x28.5x6.7cm, making them considerably more compact than full-sized rivals. Of course, at this price it's not just full-sized separates that'll compete for your attention against the Sonatas. One-box micros from Denon, Marantz and Arcam (depending on budget) call out for consideration, too – not to mention shrunken separates from the likes of TEAC. There's a sense that this system is a little last-generation in relation to current trends, as if, in this particular case, the company's cutting edge is a little blunt. In any case, the argument for buying separate hi-fi components (against getting an all-in-one) has always been that separates should sound better. Does that prove to be the case this time? Tonally, the Sonata system achieves a good balance, with impressive amounts of midrange detail. Testing its refined credentials with Beethoven's Complete String Quartets, it responds with instrumental insight and rhythmic vigour. But while the Sonata units make a decent fist of things, neither earns five stars. There's a constrained quality, marginally lacking in dynamics and fluidity, that left us wanting more. Then consider that you can buy a micro like Marantz's M-CR502 for less, and you've got a system whose stature will stay within the parameters set by its modest dimensions.